For many of us, the jump was the first kiteboarding trick we learned. It’s hard to forget that feeling of flying high above the water. a global contest open to kiteboarders of all abilities. Over 600 kiters signed up for the first XR5 Challenge to see who can go really, really big. with brand new XR5s for the XR5 Big Air Challenge trophy. Sound fun? Well, it was! After four months of fierce competition, stage one of the XR5 Challenge wrapped up, and five contest winners punched their ticket to Cape Town from the Netherlands, United States, and Taiwan! In January 2018, the crew rigged up their XR5s on Blouberg beach and attempted to dethrone world champ, Josh Emanuel. And they almost did! Josh squeaked out a win with 10cm to spare. Ben Van Der Burg ended up jumping 99.6% of Josh’s 24.3m! So Ben, how difficult is jumping an extra 11cm? Inquiring minds want to know! Winners were selected from WOO users who registered in the contest. From the get-go, impressive scores came in from Germany, Netherlands, the Canary Islands, USA, Canada, and Brazil. The largest contingent of boosters hailed from the Netherlands. as this small nation topped most of the categories. Stage two winners were selected from the monthly Stage One winners (above) and were flown to Cape Town to battle Joshua Emanuel for the XR5 Challenge trophy. The competitors spent their first few days practicing in 30+knot days. Josh then set a date for the jump-off, and the “Cape Doctor” came through with 40-knot winds. Six to nine meter XR5s hit the water and Karen scored a female world record height of 20.5m. Yes, 20.5m! The XR5 Challengers left Cape Town with big smiles and everlasting memories. We hope everyone who competed in the XR5 Challenge had as much fun as we did. Download the free WOO sports app! If you don’t already have a WOO sensor, find your closest WOO dealer here , grab a demo, and get in on the fun! 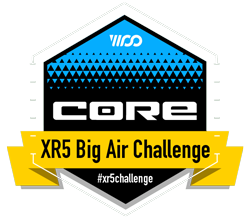 You are a Participant in the XR5 Big Air Challenge when you log your jumps on the WOO Sports Inc. app with the hashtag #xr5challenge. By accessing this website and/or uploading your WOO jump data using the #xr5challenge hashtag, you are agreeing to be bound by these terms and conditions, all applicable laws and regulations, and agree that you are responsible for compliance with any applicable local laws. If you do not agree with any of these terms, you are prohibited from participating in the promotion or accessing this site. Participation requires the use of a WOO Sensor and mobile app. Participation does not require the purchase of any specific kiteboarding equipment other than the WOO Sensor. Participants will receive a CORE newsletter subscription (which they may cancel at any time). The promotion is eligible to persons aged 18 and over. Winners under 18 years of age must be accompanied by a guardian. The guardian is responsible for their own costs. CORE Kiteboarding GmbH and WOO Sports Inc. employees, their dependents, team riders and CORE Kiteboarding GmbH contractors may participate but may not accept any prizes. International pro team riders from all kite brands are excluded from participating. That includes all participants of the Red Bull King of the Air and Megaloop Challenge. Participants who use prohibited aids, cheat or otherwise manipulate their data are excluded. Winnings will be withheld and/or reclaimed in these cases. Those who provide false data will be excluded. It is prohibited to create, upload or submit racist, pornographic, violent or otherwise illegal content. CORE Kiteboarding GmbH reserves the right to remove any or all content without notice. Owners or ownership groups authorized to sell WOO Sports Inc. products or CORE Kiteboarding products may not participate. Participants may not use foilboards in this contest. WOO Sports Inc. reserves the right to remove any contest session logged using a foilboard. Winners may not promote non Big Air Challenge affiliated brands implicitly or explicitly on WOO, Facebook, Instagram or any other social media platform (in the posts or profile names). All CORE Kiteboarding GmbH decisions are final. Participant’s personal data will be electronically processed and stored by CORE Kiteboarding GmbH and other related parties. The data collected (last name, first name, e-mail address) is used exclusively to notify the winner. The participant agrees that CORE Kiteboarding GmbH may use their data to send product or company related emails to them in the future. All personal records where storage was not agreed to will be destroyed after the draw. Unsubscribe from the newsletter at any time by clicking on the unsubscribe link at the bottom of each newsletter. The participant is free at any time to ask what personal information is stored and stop participating. Male Biggest Boost - for the highest male jump in that month. Female Biggest Boost - for the highest female jump in that month. Cumulative Height - for the male or female with the highest cumulative jump height during that month. On Nov 30, 2017, 12 monthly winners (3 categories above x 4 months) will qualify for the grand prize trips to Cape Town. A grand prize to Cape Town will be awarded to the 2 of the twelve qualifiers with the highest male and female biggest boost. The third grand prize will be awarded to the male or female with the highest average single month of boosting from the 4 Cumulative Height qualifiers. One additional grand prize winner will be selected from participants who posted photos and/or content on their social media channels with the hashtag #xr5challenge. WOO Sports Inc. and CORE Kiteboarding will select 10 photos and/or content for the community to vote on. The highest vote wins the grand prize. The promotion is held in Germany and is subject to its laws. The German language terms and condition take precedence over the English translation. Winners will be notified by email and through their WOO account within 15 days of month end, and their names will be published. The winners consent to their names being published on CORE and WOO Sports Inc.’s websites and social media platforms. CORE Kiteboarding’s privacy (found under https://corekites.com/fr/politique-de-confidentialite) policies still apply. Should a winner not reply within 21 days of notification, they will lose their award and a new winner will be selected. The participant is responsible for inputting their correct email address and contact info where required. There is no guarantee CORE Kiteboarding GmbH will successfully contact the winner(s). The published value of an award is approximate, and any prize may be substituted by CORE Kiteboarding GmbH without notice and with something of equal value. If the prize is shipped via standard ground parcel services, it is the responsibility of the winner to provide a suitable delivery address and person to accept subject delivery within normal delivery hours. A suitable alternative address may be provided for delivery in his/her absence. If the winner or their designate is not present to receive the delivery, a failure to deliver message will be left behind and the costs, if any, to obtain such delivery will be at the winner’s expense. If it is not possible or cost prohibitive to forward the prize to the winner, then an equivalent value substitute will be offered. If the advertised prize is no longer available, a suitable replacement of equal value will be provided. The grand prize covers flight costs up to 1.500€ and housing. The selection of the housing will be determined by CORE Kiteboarding GmbH. Any other expenses have to be paid by the winner himself. There are no cash prizes. Prizes are not transferable. One prize per participant per month. Participants must choose one category if they are on top of two categories. CORE Kiteboarding will arbitrarily select one if the participant does not. One grand prize per participant. Participants must choose one category if they are on top of two categories. CORE Kiteboarding will arbitrarily select one if the participant does not. CORE Kiteboarding GmbH reserves the right to cancel or terminate the promotion at any time without notice. CORE Kiteboarding GmbH cannot guarantee the successful completion of the promotion. If termination is caused by the actions of a participant, then CORE Kiteboarding GmbH reserves the right to demand compensation for damages. Participation in the XR5 Big Air Challenge is voluntary and at your own risk. CORE Kiteboarding is not liable for the transport of data over the internet (WWW). CORE Kiteboarding is not liable for unforeseen and involuntary system/computer malfunctions CORE Kiteboarding uses to process (for example, transmission, and storage) data. CORE Kiteboarding assumes no guarantee that the participant's data reached CORE Kiteboarding’s servers (and vice versa) correctly. CORE Kiteboarding assumes no liability for the negligence of the internet service providers or other transport companies. CORE Kiteboarding is not liable for minor negligence. CORE Kiteboarding is subject to German law and "Kardinalpflichten" and we refer you to the Limitations found in the German Terms and Conditions. CORE Kiteboarding is not liable for indirect damages, including consequential damages and lost profits. This also applies to the premium profits and their recoverability. The applicability of product liability law remains unaffected. CORE Kiteboarding does not verify nor is it liable for third-party content (external websites including WOO Sports Inc). The use of external third party sites is solely at the risk of the user. There is no entitlement to the permanent availability of the promotion or promotional content. CORE Kiteboarding is not liable for any damages if the CORE promotion does not operate or function properly. CORE Kiteboarding is not liable for (no fault of our own) regulatory action, labor disputes, incidental losses and force majeure. Likewise, any liability caused by the criminal acts of third parties is also excluded. CORE Kiteboarding is not liable for WOO Sports Inc., its legal representative(s), or agent(s). Only the laws of the Federal Republic of Germany and the jurisdiction of Oldenburg in Holstein apply. Participant shall hold CORE Kiteboarding GmbH, Carved Customs, CORE Kiteboarding, and its sponsors including WOO Sports Inc. harmless from any liability or expense (including equipment damage, property damage, legal fees and costs) arising from any injury or death to or damage to the participant or others by them, during kiteboarding or any other related activity. This shall include, without limitation, any liability or expense arising based upon CORE Kiteboarding’s alleged negligence or strict product liability, except when resulting from the willful misconduct of CORE Kiteboarding GmbH. All activities with CORE Kiteboarding GmbH supplied products are used at the sole risk of the participant. This Contract shall constitute the entire understanding between participant and CORE Kiteboarding GmbH and may not be altered or modified except by a written agreement, signed by both parties. Each party agrees to arbitrate any disagreements before submitting to the exclusive jurisdiction of the courts that apply to the registered offices of CORE Kiteboarding GmbH. This Agreement shall be governed by and construed in accordance with the laws of Germany, without giving effect to any choice or conflict of law provision or rule (whether Germany or any other jurisdiction) that would cause the application of the laws of any jurisdiction other than Germany. Each party hereto submits to the exclusive jurisdiction of Oldenburg i. H., Germany in any action or proceeding arising out of or relating to this agreement and each party agrees not to bring any action or proceeding arising out of or relating to this agreement in any other court. The party in any action to enforce this agreement shall be entitled to recover reasonable costs and attorneys’ fees.